A gas-guzzler normally refers to a vehicle that consumes fuel inefficiently. Those who have decided to convert their fuel inefficient cars to pollution-free efficient electric vehicles will find the job of conversion quite interesting. In addition, EV conversion saves them a lot of money over the years. However, one of the first issues to be resolved before taking up conversion is the selection of a suitable electric motor for the vehicle. The questions that normally arise are what is the best motor for an electric vehicle and where do we get it. Firstly, there are two alternatives for this; either opt for Alternating Current (AC) motor or Direct Current (DC) motor. While electricity distributed to homes is Alternating Current, the type of electric power used in torches and most radio controlled cars run on Direct Current. The requirement of voltage for electric vehicle motors is 48, 60, 96 volt and above. However, toys and remote controlled cars use only 6 or 9 volts. In this respect, certain safety aspects should also be taken into account. Most of the electric vehicles produced these days use AC motors because of several advantages. The main advantage is that they are lighter for the level of power they generate. The “regenerative braking system” built in electric cars helps in recharging the batteries whenever brakes are applied. On the other hand, the major disadvantage with AC motor is that it is costlier than a DC motor. 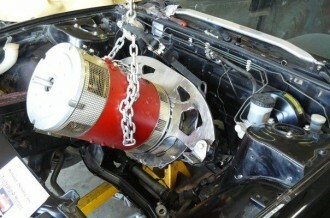 In addition, certain proficiency is needed to install an AC motor in a vehicle. The complex installation process is because of an inverter, which is required for conversion of DC electric power to AC, whereas there is no need to convert a DC motor. DC motors are ideal for homemade electric car conversions as they are much simpler to install than AC motors. What is required is to hook them up to the batteries through the control unit, which is controlled by the accelerator cable, just as a carburetor controls the flow of fuel into the gasoline engine. A common DC electric motor lasts a couple of conversions depending upon how it is maintained. A reconditioned DC motor is sometimes a good option, particularly for initial conversion. It will be comparatively much cheaper and it will last long if it is maintained properly. A local scrap-yard is the best place to locate a used DC motor. DC motors are classified based on their diameter and for conversion of a vehicle to an electric car, a motor with a diameter ranging from 9 to 13 inches would be adequate. These types of motors are not that heavy and their Power Factor is quite high. The best option for those who have an aptitude for do-it-yourself (DIY) conversion of a gasoline-powered car to an electric vehicle is go in for DC motor. The next step is to decide on the size and voltage of the motor. The size of the motor depends upon the power of the motor, which, in turn, should correspond with voltage of the battery packs. In general, if the size of the motor is larger, the bigger battery pack, adding up to higher voltage, would be required in the system. Electrical vehicle admirers and manufacturers are doing their best to assist those who are trying to make the atmosphere pollution-free and save the earth from the effects of global warming.